S.S. Catherine is the sister ship to the highly acclaimed S.S. Antoinette and launched in the spring of 2014. Continuing the "Super-Ship" lineup for Uniworld Boutique River Cruise Collection, this is one ship you do not want to miss out on! S.S. Catherine features voyages along the Rhone, Saone, and Seine rivers in Burgundy and Provence areas of France. Sailings along these rivers will allow guests to visit memorable sites such as the beaches of Normandy and World War II memorial, Paris, Provence and Burgundy to experience things like art, food & wine tastings, castles & church tours, and all the other great things in the French countryside. 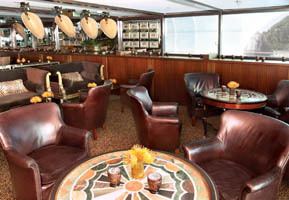 On the inside, S.S. Catherine boasts all the modern amenities that one would expect to find on a luxury river cruise. S.S. Catherine contains five spacious suites each measuring over 300 sq. ft and even includes an additional Royal suite which tops off at over 400 sq. feet! All staterooms feature beautiful marble bathrooms and handcrafted Savior of England beds. 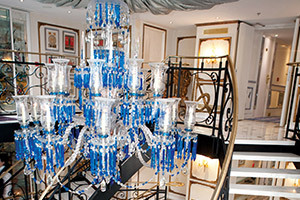 Elegance onboard S.S. Catherine does not simply end at the staterooms. The Leopard Lounge makes a return from S.S. Antoinette featuring a unique jungle theme complete with leopard print furnishings, elephant-head bar rails, and various other touches. 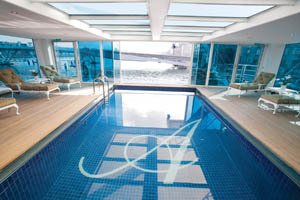 S.S. Catherine is one of the few river cruise ships to feature a pool onboard as well as a spa area. The main dining area includes an outdoor terrace that allows guest to enjoy delicious foods in the fresh French air. Along with all of these features will be the classic Uniworld staples such as hand-selected art, classic furnishings, old world antiques, and clever uses of both mirrors and marbles. One of the most exciting highlights of any river cruise are the shore excursions and S.S. Catherine does not disappoint. At every port of call along your river trip you will enjoy a guided tour of that town or city. Additionally some stops may include a bus tour that will take you to magnificent views or towering castles. Feeling independent? Then take complimentary bikes out around town and create your own shore excursions. 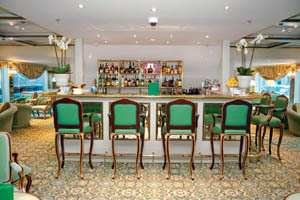 S.S. Catherine provides its travelers with some of the best in local cuisines. Enjoy complimentary beers and wines with your cruise. Even take advantage of unique local wine and food pairings that will envelope you with local culture. From German sausage to the sweetest Rieslings, your taste buds will be traveling right along with you. S.S. Catherine features an amenity not found on many river cruise ships, a pool. With long walking shore excursions all day, there is no better way to relax before dinner then a quick dip in the pool. With so much water passing by you everyday why not get to enjoy some it! Low Price Guarantee on all S.S. Catherine Cruises! Book any S.S. Catherine river cruise with us and you'll get the best deal possible, regardless of the ship or sail date! 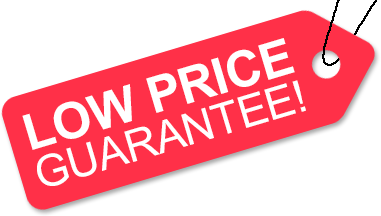 Because of our "Low Price Guarantee," nobody beats our S.S. Catherine cruise prices, so look around and you're sure to find the best S.S. Catherine cruise deal possible when booking with us! We do not charge booking fees on any cruises! You're sure to enjoy an affordable S.S. Catherine cruise when booking with us! Our special offers on S.S. Catherine cruises may not be combinable. Certain restrictions apply to each offer. Click a price below to view the S.S. Catherine cruises during that month in that destination. 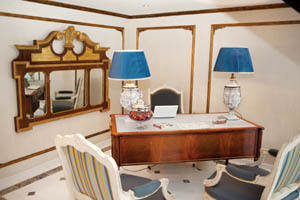 There is 1 Royal Suite stateroom on board S.S. Catherine. This accommodation can fit up to 2 guests. The Royal Suite includes all amenities listed above. There are 5 Suite staterooms on board S.S. Catherine. These accommodations can fit up to 2 guests. The Suite includes all amenities listed above. There are 25 Category 1 staterooms on board S.S. Catherine. These accommodations can fit up to 2 guests. Category 1 cabins include all amenities listed above. There are 29 Category 2 staterooms on board S.S. Catherine. These accommodations can fit up to 2 guests. Category 2 cabins include all amenities listed above. There are 7 Category 3 stateroom on board S.S. Catherine. These accommodations can fit up to 2 guests. Category 3 cabins include all amenities listed above. There are 8 Category 4 staterooms on board S.S. Catherine. These accommodations can fit up to 2 guests. Category 4 cabins include all amenities listed above. There are 4 Category 5 staterooms on board S.S. Catherine. These accommodations can fit up to 2 guests. Category 5 cabins include all amenities listed above. There is 1 Category 5 Single stateroom on board S.S. Catherine. Category 5 Single cabins include all amenities listed above. The deck plans of S.S. Catherine provided on this page are subject to change. We reserve the right to correct errors. Please verify all information with Uniworld directly. 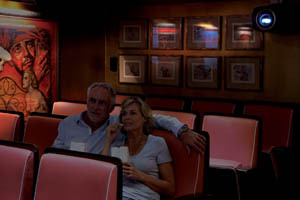 For photos of staterooms, please click the accommodations tab provided above. The following photos are of S.S. Catherine's sister ship, S.S. Antoinette. Ship is subject to modifications.